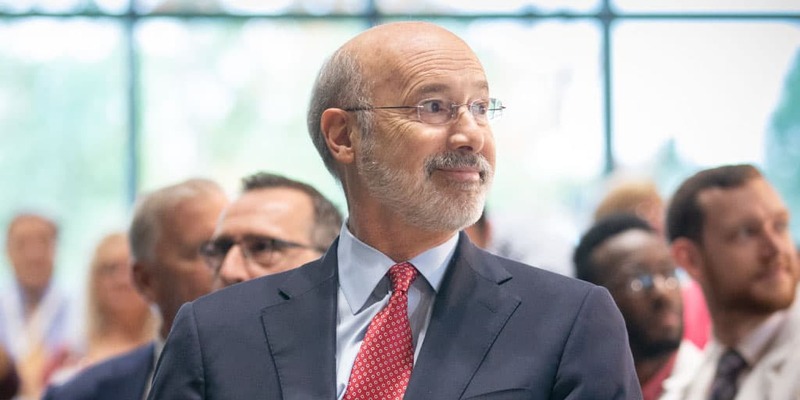 Harrisburg, PA – Governor Tom Wolf (photo) is providing students with more options to meet high school graduation requirements than a high stakes tests by signing Act 158 of 2018. “How a student does on high stakes tests is not a useful way to decide if someone is ready to graduate from high school,” said Governor Wolf. “This new law gives students several options to demonstrate what they’ve learned and that they’re ready to graduate from high school to start a career or continue their education. Pennsylvania’s former graduation requirement, the Keystone Exams are end-of-course exams in Algebra I, Literature and Biology. Since 2016, a series of moratoriums have been enacted on the use of Keystone Exams as a statewide graduation requirement. Earn a satisfactory composite score on the Algebra I, Literature and Biology Keystone Exams. Earn a passing grade on the course associated with each Keystone Exam, and earn a specific score on certain exams, complete a pre-apprenticeship program, gain acceptance to an accredited 4-year nonprofit institution of higher education or meet other requirements. For Career and Technical Education (CTE) concentrators, earn a passing grade on the course associated with each Keystone Exam, and attain an industry-based certification, pass an industry-based assessment or meet other requirements. Earn a passing grade on the course associated with each Keystone Exam and demonstrate readiness for postsecondary engagement through three pieces of evidence aligned to student goals and career plan. “This is another step in the Wolf Administration’s commitment to provide a more comprehensive approach for measuring student achievement and ensuring that students are prepared to graduate and begin a career, earn a certificate or enter college,” said Secretary of Education Pedro A. Rivera. More information about the new statewide graduation requirement, which goes into effect for the graduating class of 2021-22, is on the PDE website.